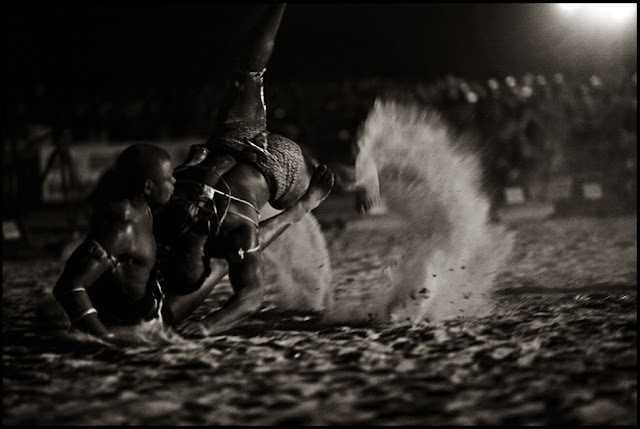 Traditional wrestling, also known as “Laamb” in Wolof, is a centuries-old sport in Sénégal. In terms of form, it is very similar to the Greco-Roman style of wrestling; however, it is very typical of traditional, African wrestling. 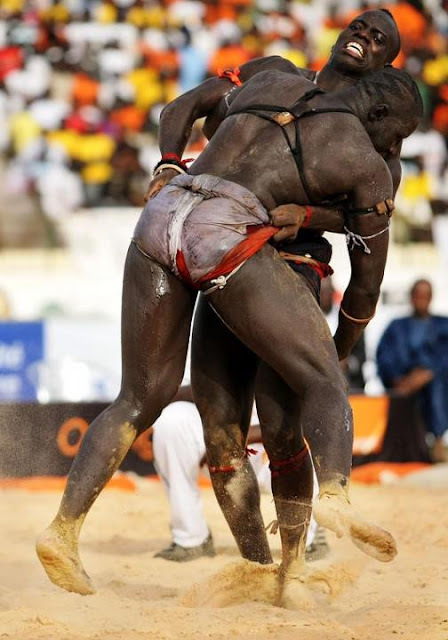 There are two forms of Laamb: the first allows the wrestlers to strike each other with their bare hands, which can be painful; the second is more acrobatic, and hitting is not permitted. When a wrestler’s back touches the ground, the bout is over; he has lost. 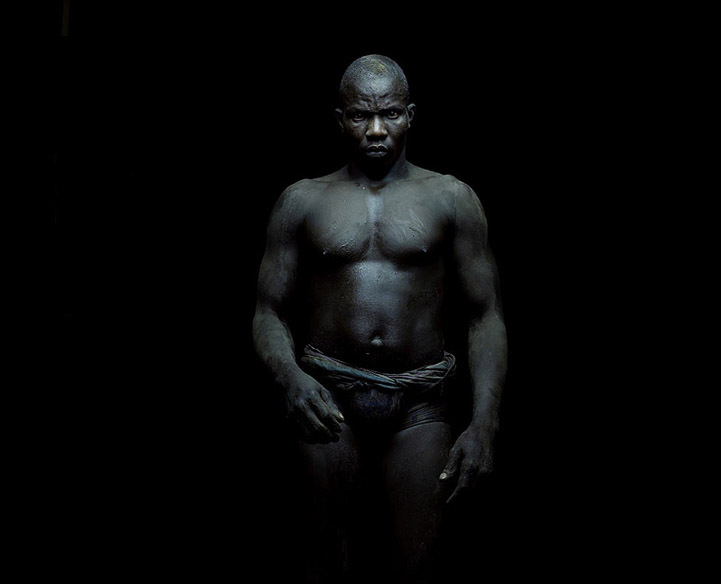 Laamb is as much a spiritual activity as it is physical; and wrestlers engage in various rites and rituals preparatory to fighting. 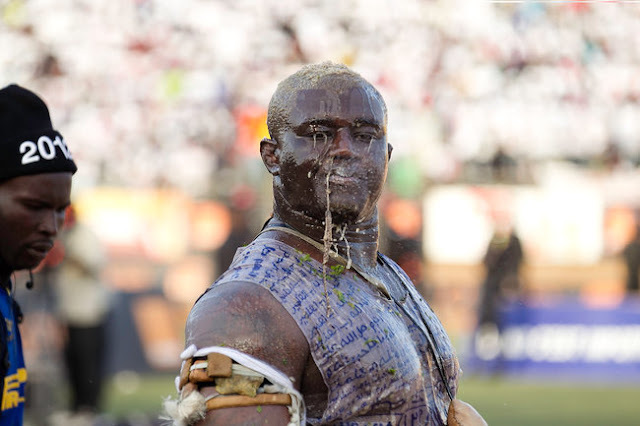 No wrestler, regardless of his strength, physical, or technical abilities, will ever dare to enter the ring, much less fight, without his “marabout” or without participating in his own pre-match ceremony. 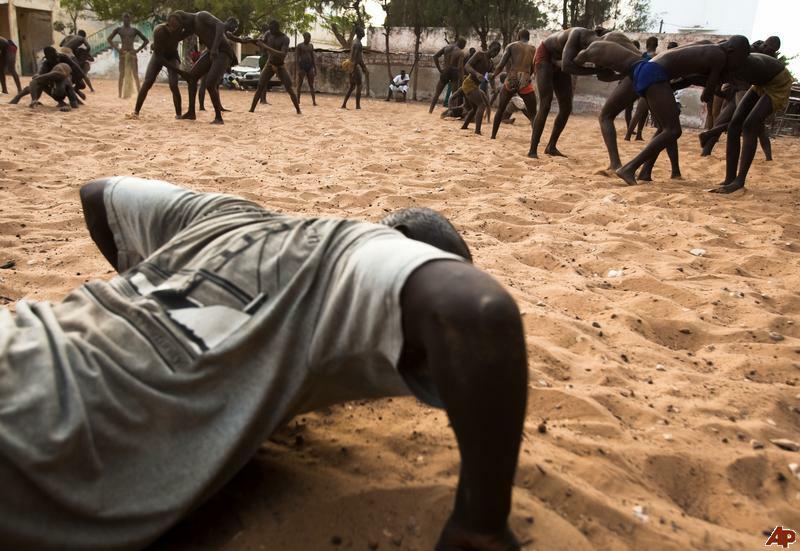 The Allure of Laamb: Although traditional wrestling exists in various forms throughout West Africa, the version in Senegal, known as laamb, has reached unparalleled heights. 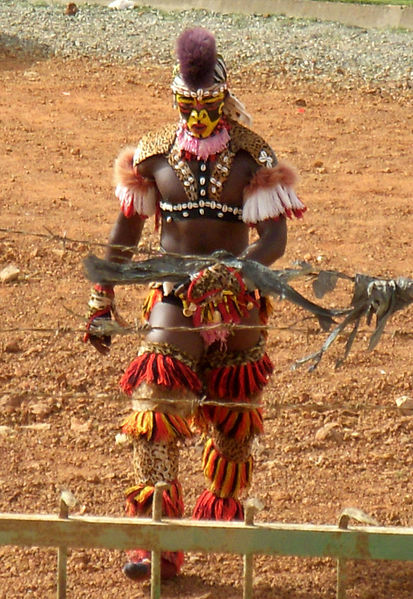 During the ceremony, the wrestler, accompanied by drummers and singers, dances around the arena; around his arms, legs, and waist are various kinds of esoteric pendants or amulets the purpose of which is to protect him against evil spirits and the witchcraft of other fighters. It is this aspect of the sport which elevates a wrestling match beyond the level of ordinary spectator sport. Many people attend as much for the enjoyment of the ceremony as for the sport. 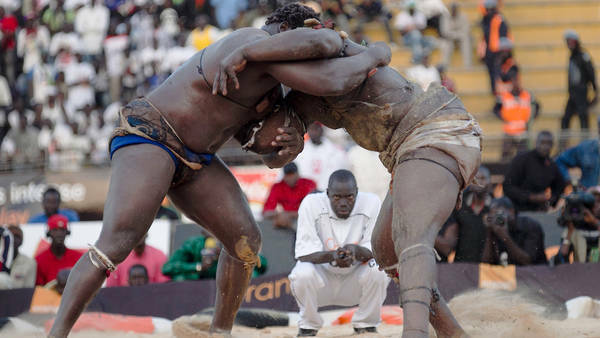 In spite of the popularity of soccer, basketball, and other imported sports, traditional wrestling is still the national event for the people, and receives a lot of sponsorship dollars to advance its growth. National champions are crowned and praised as the subject of numerous songs. It used to be practised in the countryside at the end of the harvest, amongst the Serer and Diola ethnic groups. 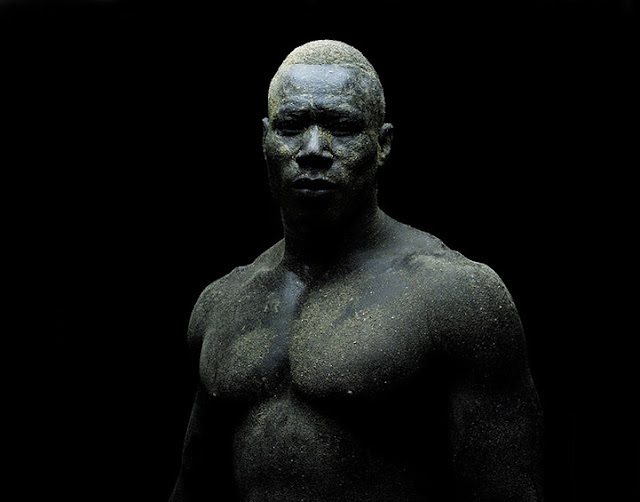 Wrestlers face up to each other, and the winner is the one who causes his adversary to fall to the ground first. This jousting battle used to be a means of measuring the strength of men, to determine the champion of each village. It was practiced to rejoice, perpetuate cultural folklore, and to designate the strongest man of the village who will become the champion wrestler until the next year. 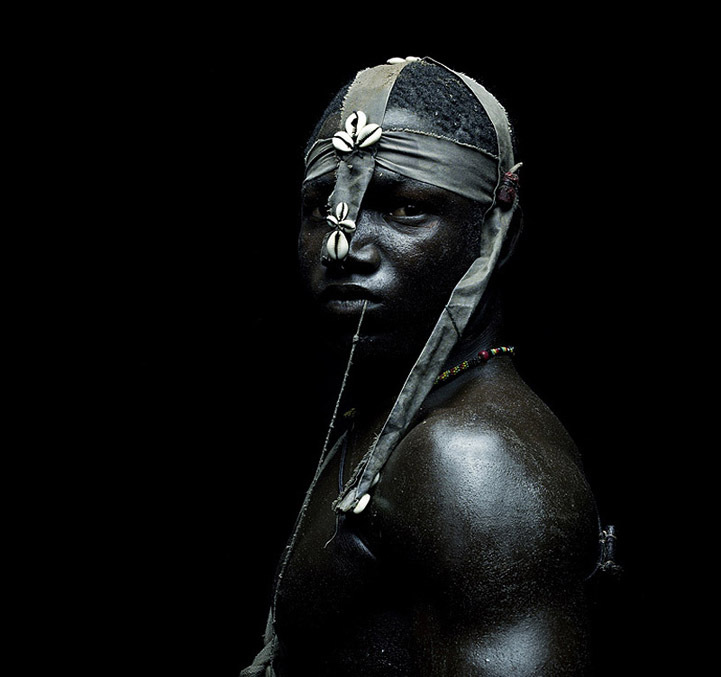 During French colonization of Senegal, these fights continued to take place in the bush, without the occupiers really knowing much about them. 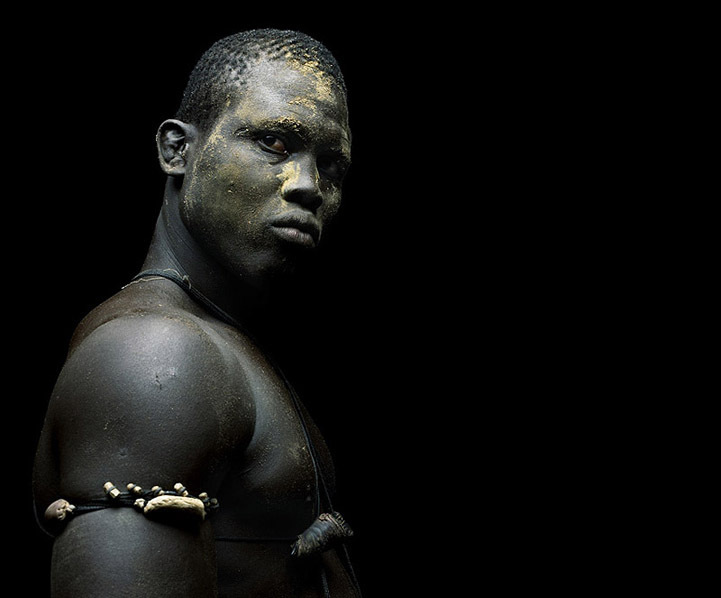 However it was a Frenchman who organized the first official fights in the 1920’s in his cinema El Malik in the capital, Dakar. The wrestlers were paid thanks to ticket sales. It was around this time that a form of the sport began in which wrestlers could also hit their opponents (wrestling with strikes). After independence, this form of the sport slowly became professional and took hold in towns and cities. Many called it the biggest match of all time. Others, just the biggest of the season. The marquee combatants arrived in the late afternoon, welcomed by musical odes and a chorus of erratic drumming. 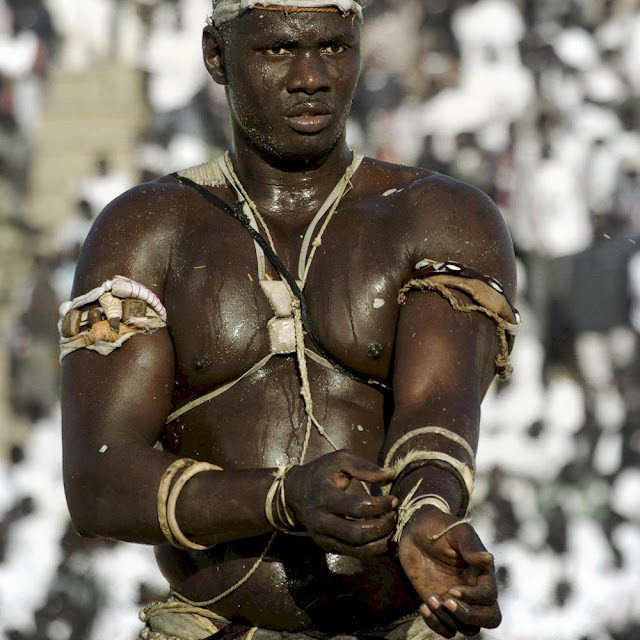 Each defied his massive frame, nimbly performing the “dance of champions” and taking measures to repel black magic before stepping into the ring. The preparations at the stadium for the fight last month lasted hours; the bout, mere minutes. For the wrestlers and their fans, however, the outcome would endure for years. 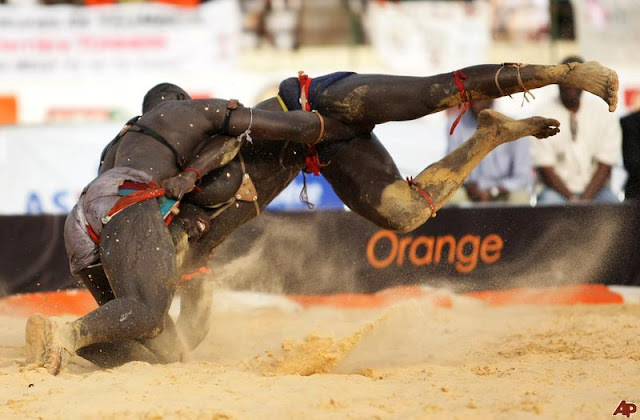 Although traditional wrestling exists in various forms throughout West Africa, the version in Senegal, known as laamb, has reached unparalleled heights. Laamb ends when one of the wrestlers puts his opponent’s head, back or both hands and knees to the ground. Unlike other forms, laamb allows punches in certain matches. 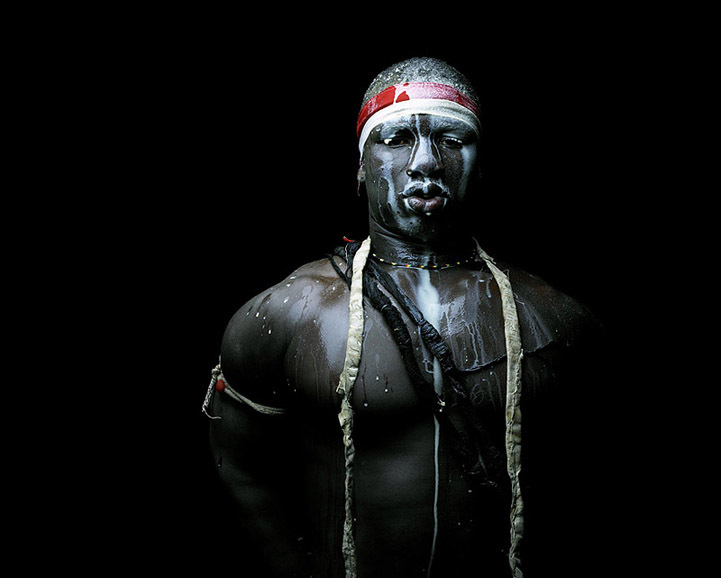 Those matches are the ones upon which wrestlers, spectators, sponsors, promoters, shamans, musicians and journalists descend every weekend. The centuries-old sport began as a leisure activity for fishermen and farmers, as those with catches and crops to spare would occasionally wager them on the outcomes. 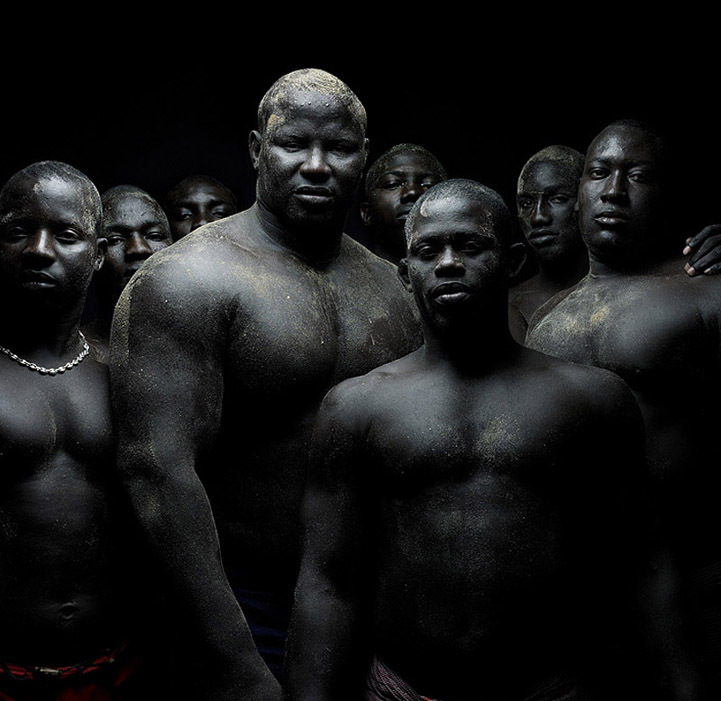 Laamb became a viable profession around the time Senegal achieved independence from France in 1960; wrestlers began receiving about $200 for a match. 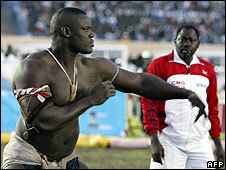 Balla Gye and Yekini are the Senegalese top wrestlers. Today, the going rate is $100,000 for top-tier matches, not including the sideshows. 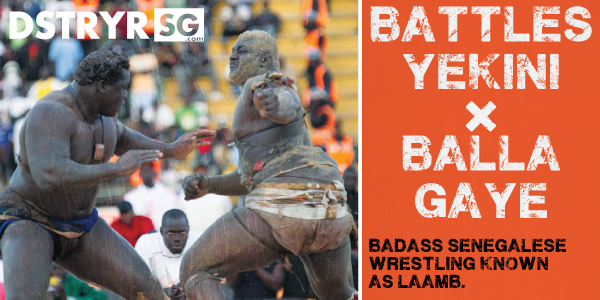 With appearance fees and kickbacks surrounding the bout last month, the combatants — Yahya Diop, who uses the stage name Yékini; and Omar Sakho, who goes by Balla Gaye 2 — each received about $300,000, according to the local news media. 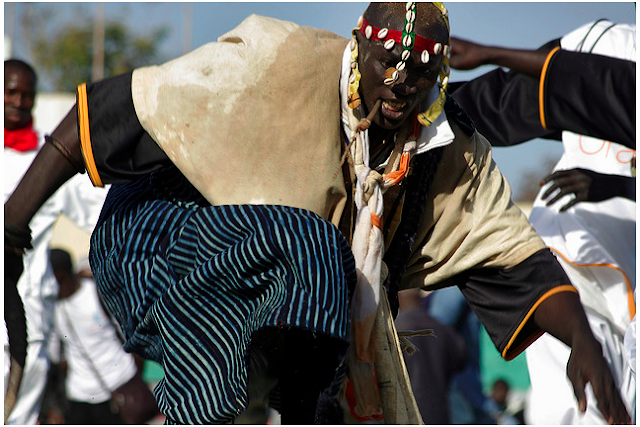 Such payouts are made possible through the sponsorship of multinational corporations operating in Senegal, which has experienced average annual gross domestic product growth of more than 4 percent over the last 20 years. But the country is plagued by wealth disparity. 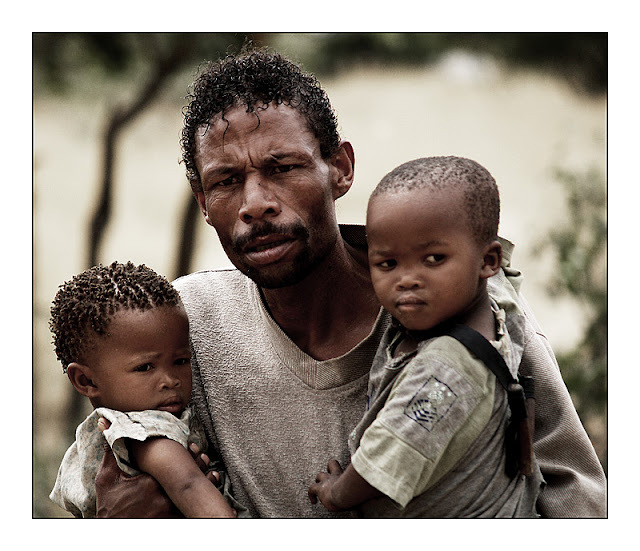 With nearly half the population living below the poverty line, laamb represents an opportunity for many young men to lift themselves, and the families they are responsible for, above that line. 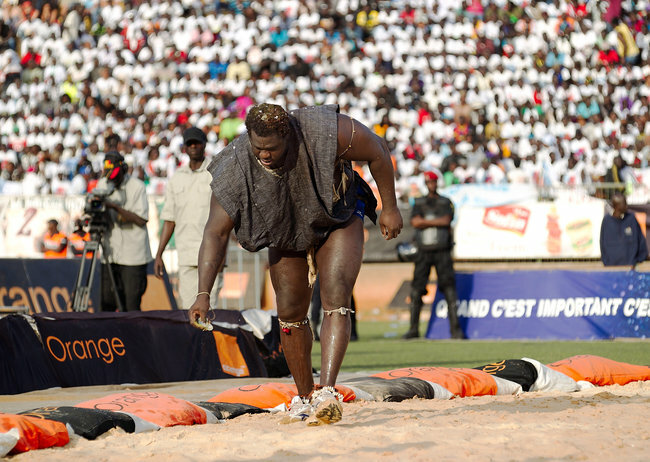 Fans of Balla Gaye 2 reacted during the championship. But the percentage of wrestlers who become rich in the sport is minuscule. Of more than 3,000 registered wrestlers, only a dozen earn more than $100,000 per combat, and those wrestlers have only one match per year. Yékini blessed the ring with a substance given to him by his spiritual guide. He was paid about $300,000 for the marquee bout. During a season, he added, a vast majority will earn less than $2,000 in the ring, and many will earn nothing. 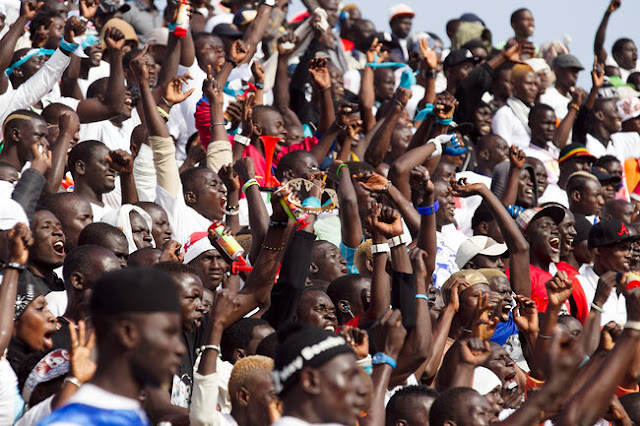 The sport, like much of the population, is migrating from rural to urban and finding a home in the suburbs of Dakar, where opportunities are low and crime is high. 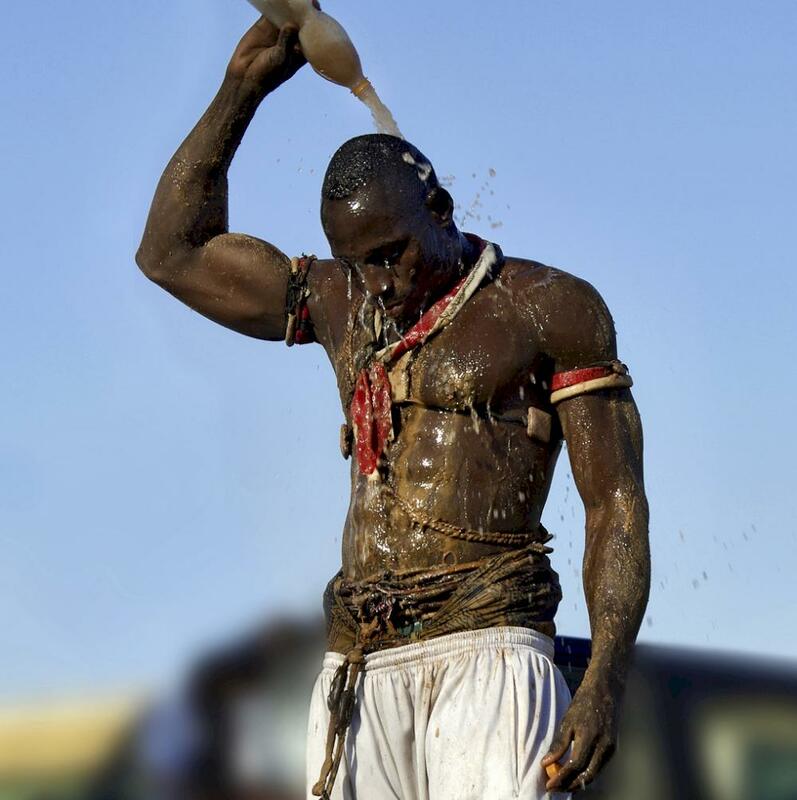 In traditional societies in Senegal, wrestling is not violent and involves more wit and skills, dancing etc...so it is fun and entertaining and this is its purpose. But, since big sponsors took over, things have gone out of hand. Wrestlers and fans of wrestlers fight now in and out of wrestling field. Lot of tension between some wrestlers and fans of wrestlers. 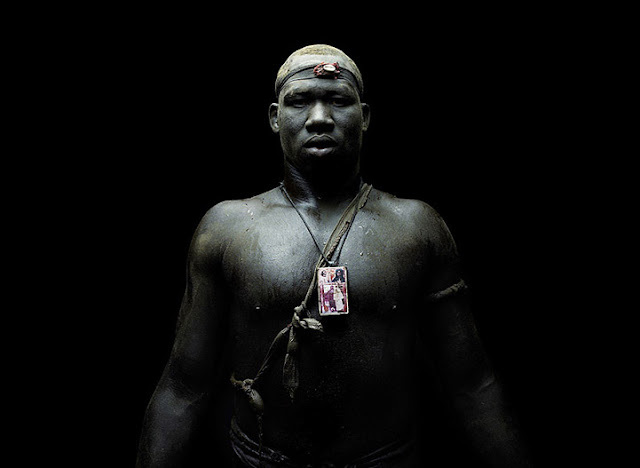 One thing you may not know is that most of the big Senegalese wrestlers nowadays go to New York and in rare cases in Europe to train before major combats because they get big money. So, you may run into one of them if you are in the NY area. I don't like the violence ...I mostly enjoy the skills of wrestlers and his capacity to entertain the crowd with dance steps. By the way most of the new wrestlers come with new dance steps and have a whole crew who dance with them when they enter the stadium. It's lot of fun. I just hope the cases of KO that happened recently be the last ones. A "false lion" (simb) dancer who participates in the ceremony prior to matches. 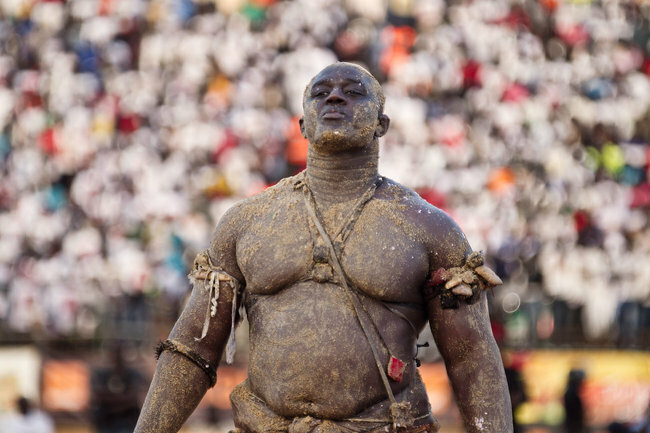 Next time you watch wrestling mania episodes remember you are watching what traditionally was also and is still part of our African history and culture. 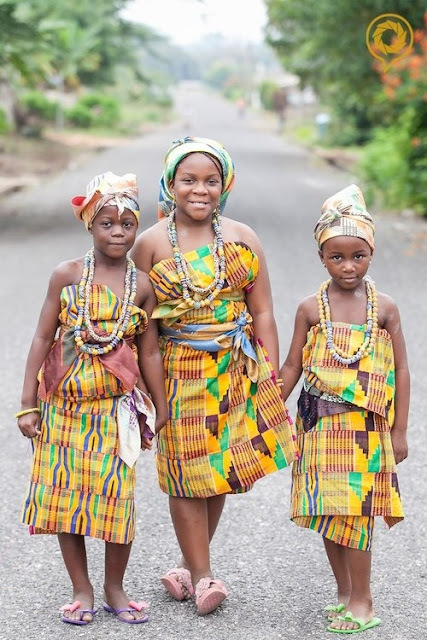 We have it here and it is not alien to the Black people and the African continent.